While others spent their childhood playing and speaking, Nathaniel spent his singing, composing, and shouting out endless amounts of original songs. Nathaniel has been playing, singing and entertaining throughout his childhood, and began writing and composing since he learned to talk. He has also been recording his own songs as early as middle school. Drawing from eclectic influences such as Damien Rice, Elliot Smith, Mumford & Sons, Pink Floyd, and Oasis; the result is a singer-songwriter with a rather unusual blend of an alternative sensibility, and strong acoustic folk roots. With haunting lows and soaring highs, Nathaniel prides himself as a Do-It-Yourself musician and producer, and has composed and recorded all his original works completely by himself. 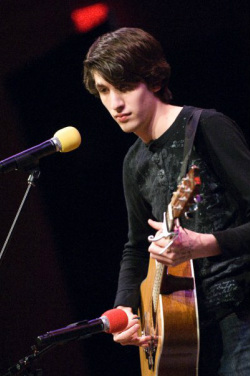 In addition to playing the guitar, he plays the piano, and is a self-taught bassist, vocalist, and percussionist. He has been writing and recording original music in various genres and forms since 2003. After releasing his first official release “Kill Me You” in 2010 (Available on iTunes), Nathaniel’s new album, “Together in the Rain,” was released on December 21, 2011. "Together in the Rain" provides listeners with a much more concise, focused, and mature feel to the unique style that Nathaniel presents, while retaining the raw emotional energy of the first album, combined with powerful dynamics, and highly personal lyrics. Both albums are currently available on Spotify and iTunes. Released June 1, 2012, the Production EP was released. This 7 track EP features both new songs, and previously released older songs re-recorded, using resources provided by Goshen College. This release is the next step in the evolution of Nathaniel's sound, which attempts to further distill a unique combination of folk sensibility and indie rock. Please click here to visit my soundcloud page for samples of my music.